Conflict turns bad in the church when it goes outside of the parameters of God’s love. 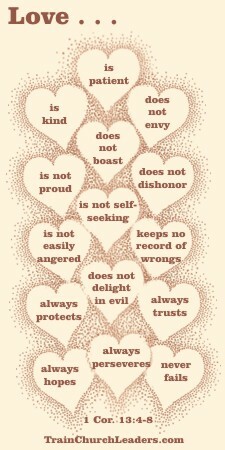 Perhaps we can use the traits listed in 1 Corinthians 13 as our litmus test as “love never fails” (v. 8). You’ll find that some of the traits are worded positively and others negatively. We need the presence of certain traits and the absence of others for our disagreements to stay healthy and aligned with our purpose to love God and others. Patient: Are we being patient with people who disagree with us? Kind: Are we being kind to those who have done us wrong? Always Protects: Are we always considering what will edify rather than tear down? Always Trusts: Are we always willing to give people the benefit of the doubt? Always Hopes: Are we always looking for God’s potential in other people? Always Perseveres: Are we always willing to hang in there while working toward resolution? Envy: Are we being resentful toward those who seem to come out on top? Boastful: Are we sure to take the credit when we seem to come out on top? Proud: Are we letting pride stand in the way of compromise? Dishonoring: Are we putting others down for their views or ways of doing things? Self-Seeking: Are we approaching the issue only from the vantage point of our personal agenda or interests? Easily Angered: Are we too quick to let people get under our skin? Keeping Record of Wrongs: Are we holding people’s mistakes against them? Delight in Evil Rather than Truth: Are we willing to slander people for the purpose of getting our way? Conflict will happen but it is no time to lay aside our purpose of loving God and others. If anything, it is a time to all the more adhere to and work toward it.